The first feature has been scouted out and interviewed! Please wlcome Cassini closet, Mascot Cosplay Extraordinaire. The talented Cassini Closet is this month’s featured cosplayer. She has been cosplaying since 2009 and has won a number of awards for her Mascot Cosplays. In October she was part of a fantastic skit about the Card Captors at Anime Banzai. Cassini showcased her Keroberos Cosplay, above picture, in the skit and captivated the audience and judges. The skit won Best in Show. I chose Cassini as the first feature for this blog because she has never ceased to amaze me. From her Mascot Cosplays to her plushie dolls, this girl is very talented and inspirational. I really look forward to her creations. 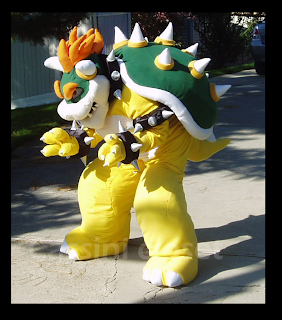 In the above photo Cassini is working hard on her Bowser cosplay. Here is a list of Cassini's websites where you can find more of her work and tutorials as well. Many cosplayers have titles or cosplay names. Why did you choose Cassini Closet? When I started cosplaying I wanted to make items, props, and articles of clothing more than the entire outfit of a character. So it’s “whatever you’d find in a closet” and it’s mine, so it’s ‘Cassini’s Closet’ though it’s been cut down to just “Cassini Closet” and sounds a bit improper of speech. I have been mocked about ‘being in the closet’or ‘coming out of the closet’ with this name. I don’t give much thought to that. “Cassini” actually came from looking at an Astronomy book. The school class I was born into had a lot of boys and girls named ‘Cassandra/Cassie/Casey’ of multiple variations. And I was no exception though I was named after an ancestor. I found out there’s a satellite named “Cassini’ after the Italian name, and it wasn’t too different from my own name so I use it as one of my many aliases. When did you start sewing/cosplaying and what interested you about it? Are you self taught or did you have a teacher? I started to sew after TLC class in middle school, and I’ve been actively sewing 8 years now. I got into Cosplay around 2009. I attempted at some human Cosplays and failed miserably. I got better at fabrication and choice of cosplay by last year 2011. I heard about Cosplay from some friends at High school after I attended my first convention and saw the awesome things that could be accomplished. Being fascinated with costumes and born into a family that celebrates Halloween like Christmas, it was bound to be something I’d fall into. After seeing some of the errors that can come with ordering Cosplays online and none of them would fit a person my size, I decided I’d sew my own. I can’t say I’m completely self taught. 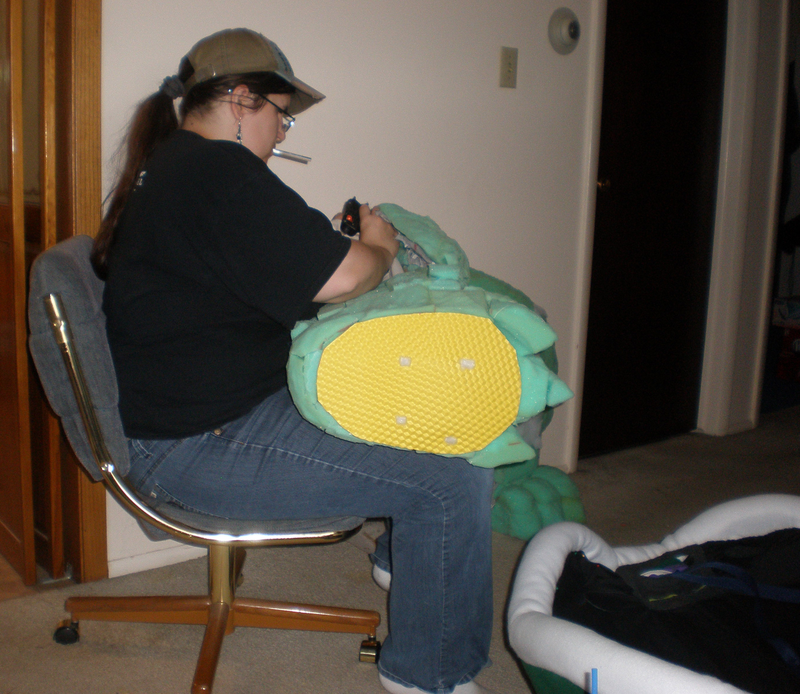 I’ve had help from friends, and my Mother, on how to run a sewing machine. But now I find myself threading the machine for her to sew on. I did stumble upon a cosplayer on the internet that made a Charizard partial and it really inspired me to get into making creatures instead of trying to cosplay humans. 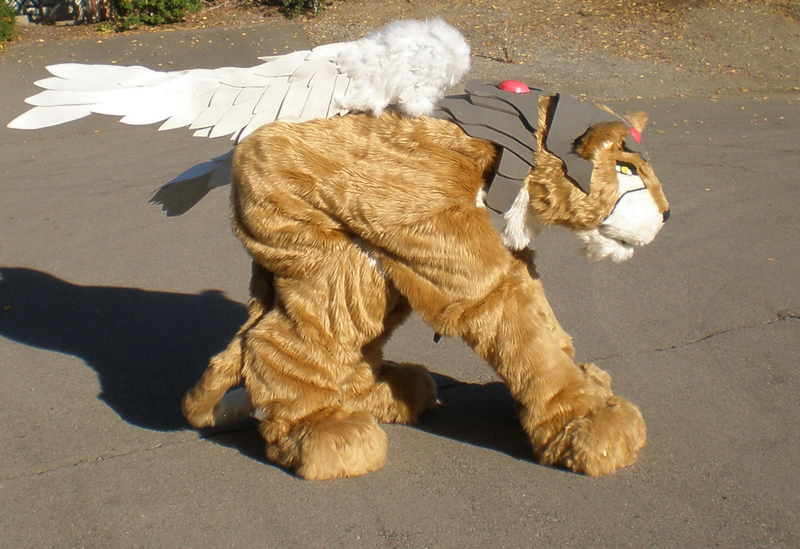 I do have to give some credit to CanineHybrid for getting me on the path of large creature cosplaying. Though through the years I’ve been given lessons to from professional seamstresses, and did my research on the internet along with experimenting on my own, it’s where it’s lead me today. Fun Fact: Renamon was made of foam, fleece, some fake fur, and several bags of hot glue sticks. It weighs about ten pounds and took Cassini over 200 hours to create. Well I don’t fit the petite Japanese school girl type. So asking me to pull that off is out of the question. And when you have a desire to do something you tend to not fall into so easily you have to find your own notch. That’s where I found creature cosplay to be my outlet. I also love working with anything as long as I can use my hands. I’ve taken several pottery classes in school and carving foam isn’t much different. How do you choose a character to build? With a very large list of questions to myself: Could I pull it off and make it happen? How much time do I have and need to work on it? Will it be something I want to finish? Will it be something challenging enough? How will I move? How can it be stored away inside a car or room? How will I put it on and take it off? Etc. These questions need to be answered honestly and they continually occur when you find something that would be a fun project. Sometimes it’s for personal reasons and sometimes it’s because someone asked (dared) me to do it. Your cosplays are larger than life showstoppers. Describe your favorite reaction to one of your cosplays. 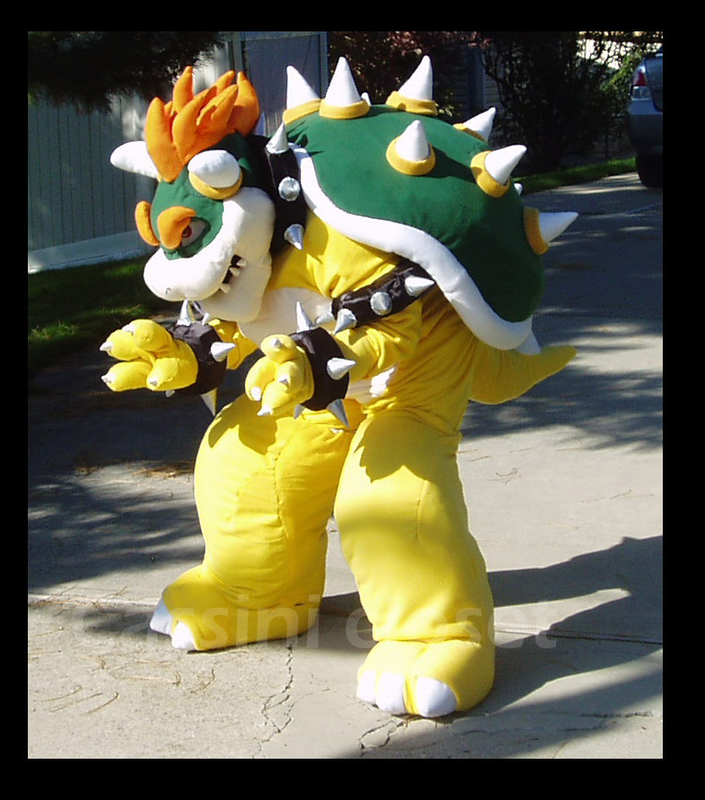 I was cosplaying Bowser from Mario at 2011 Anime Banzai and this person, I couldn't see him all that well, but he was in a wheel chair and I could tell he had some challenges. He wanted a hug and said to me “ Bowser is my favorite.” That touched my heart. I’ve worked with specialty challenged individuals before and making one smile for a brief second made it all worthwhile. Fun Fact: Bowser's shell is a snow sled! At Anime Banzai this past year I saw that your family was there to help you with your cosplay of Kero and support you in the contest. What were their thoughts when you first started tackling Mascot Cosplays? My parents have been very supportive and I’m beyond blessed by them. When I began with these costumes I really wanted to avoid such words as “furries” to them. It’s not a fursuit, it’s another branch of cosplay. But methods to build them are used in both costume making. My dad said about a year ago “ I don’t mind you making them out of fleece, just not fur, you’d be a furry if you started tampering with fur so I guess you’re a ‘fleecy.’” Well that ended with Kero being 90% two inch pile Faux fur. 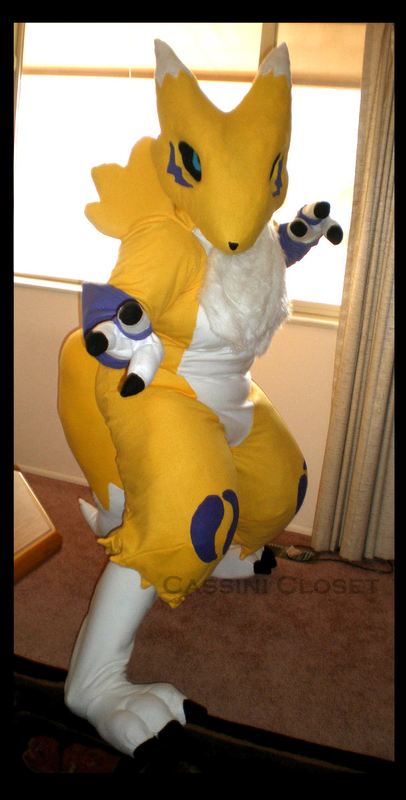 A friend of mine was a spotter when I wore Renamon at Fannatiku Con in 2011 and also Bowser at Anime Banzai in the same year. And after that my parents have stepped in occasionally to help be spotters and supporters. It takes two or more people to operate these monstrosities. I do feel bad to rely on them so much, and have yet to find someone of similar age and energy to share this talent with. I do thank stage ninjas for their help too; last thing to avoid is tumbling off stage. Inside the mascot a lot of your senses such as sight, hearing, and touch are limited. And it’s kind of fun to explain to others that are unfamiliar to this art how things work, like a quad suit has arm stilts, and digitigrade padding or stilts for animal like features, and how I made other parts of the costume.